The United States of America holds claim to 16 territories outside of the United States. These range from Puerto Rico, with over 140 smaller islands and over 3 million residents, to uninhabited territories (and disputed territories) such as Bajo Nuevo Bank, Navassa Island, Serranilla Bank, and Wake Island. The United States has many political, defensive, social and other reasons to claim these territories as important lands of the United States. However, another important reason to claim them is for their resource potential. Those territories that consist of an island or a cluster of islands are surrounded by sea floors that may contain important mineral, energy, and food resources. By claiming them, the United States claims rights to an exclusive economic zone that extends up to 200 miles offshore (or half of the distance to the nearest shoreline claimed by another sovereign state). The map above shows the geographic importance of the exclusive economic zones. Although the United States claims only a few islands in the Pacific Ocean, these territories give the U.S. exclusive economic claim to an enormous extent of the Pacific Ocean seafloor. These areas might be underlain by oil and gas, stratified mineral resources, or mineral materials in the shallow seafloor sediments. These might also have potential as important fishing, aquaculture, or marine ecosystem areas. The United States Department of State has defined the Nation's sovereign rights , and the United Nations has defined important information about The Law of the Sea . Public domain map by NOAA. Guam satellite image by Jesse Allen and Robert Simmon of NASA. Click to enlarge. American Samoa: A group of islands (5 volcanic islands and 2 coral atolls) in the South Pacific Ocean, located about halfway between Hawaii and New Zealand. American Samoa lies just southeast of the Independent State of Samoa, from which it was separated in 1899. Over 50,000 people live in American Samoa, and people born there are considered non-citizen nationals of the United States. Guam: An island in the North Pacific Ocean. It is the southernmost and largest island in the Mariana Islands archipelago. It has a population of approximately 162,000. People born in Guam are granted U.S. citizenship. Northern Mariana Islands: A group of 15 islands in the North Pacific Ocean. 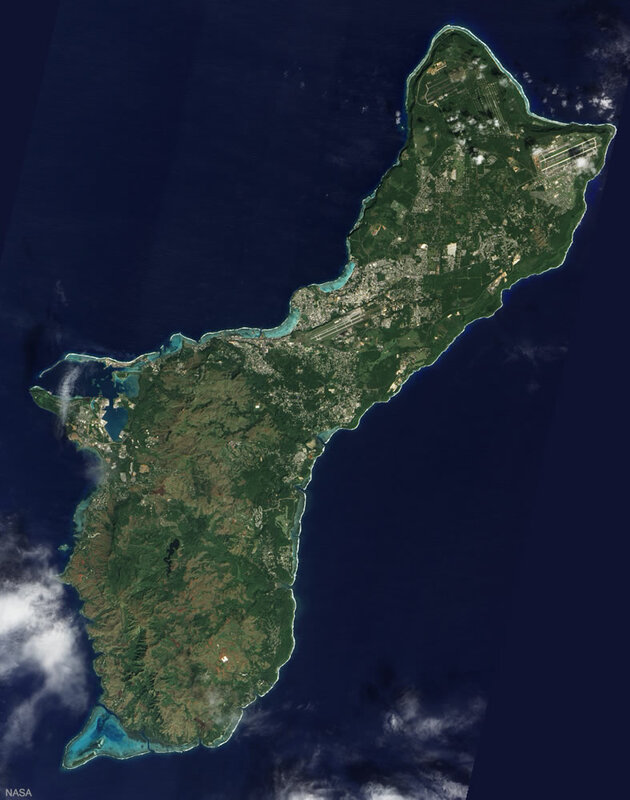 There are over 50,000 people living in the Northern Mariana Islands, with the majority living on the island of Saipan. People born in the Northern Mariana Islands are granted U.S. citizenship. Puerto Rico: Includes the main island of Puerto Rico and over 140 smaller islands in the Caribbean Sea. Puerto Rico is the largest and most populous of the U.S. territories, with over 3 million residents. People born in Puerto Rico are granted U.S. citizenship. U.S. Virgin Islands: Located in the Caribbean Sea, just east of Puerto Rico. They include the three main islands of St. Thomas, St. John, and St. Croix, along with nearly 80 smaller surrounding islands. Over 100,000 people reside in the USVI. People born in the USVI are granted U.S. citizenship. Johnston Atoll satellite image by NASA. Click to enlarge. Baker Island: An atoll in the Pacific Ocean. It lies just north of the equator, about halfway between Hawaii and Australia. It is a National Wildlife Refuge for seabirds, shorebirds, and marine wildlife such as turtles. Howland Island: A coral island in the Pacific Ocean, located slightly northwest of Baker Island. Howland Island was to be a refueling stop for Amelia Earhart during her 1937 flight around the world, but Earhart and her airplane mysteriously disappeared without reaching the island. Today, Howland Island is a National Wildlife Refuge. Jarvis Island: A coral island in the Pacific Ocean, located just south of the equator and about halfway between Hawaii and the Cook Islands. It is a National Wildlife Refuge for seabirds, shorebirds, and marine wildlife. 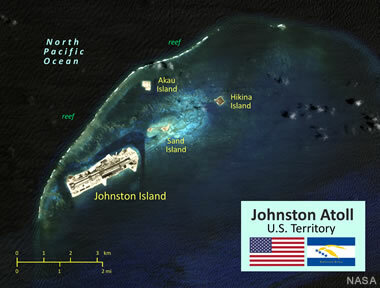 Johnston Atoll: Comprised of four islands atop a coral reef platform. It is located about 860 miles southwest of Hawaii. Coral dredging was used to quadruple the size of Johnston Island and double the size of Sand Island. The artificial islands of Akau and Hikina were also created with coral dredging. Although Johnston Atoll was controlled by the U.S. military for many decades, today it is administered as a National Wildlife Refuge. 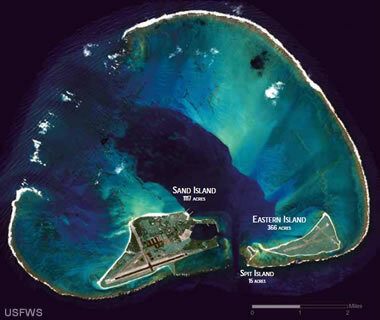 Midway Atoll aerial photo by the U.S. Fish and Wildlife Service. Click to enlarge. Kingman Reef: A partially submerged reef located about one-third of the way between Hawaii and American Samoa in the North Pacific Ocean. Above sea level, the reef is often awash and cannot support permanent plant and animal life. However, it is a National Wildlife Refuge for a diverse variety of marine wildlife. Midway Atoll: Named due to the fact that it is an atoll about midway between Asia and North America. It is also approximately halfway around the world from the prime meridian. Midway Atoll is part of the Hawaiian archipelago but not part of the state of Hawaii. Although there are no permanent inhabitants, there are residential facilities available for U.S. Fish and Wildlife Service staff. The atoll is a National Wildlife Refuge which hosts Hawaiian monk seals, green sea turtles, spinner dolphins, squid, octopus, crustaceans, fish, various seabirds, and the world's largest colony of Laysan albatrosses. Palmyra Atoll: A cluster of about 50 islets in the North Pacific Ocean, just southeast of Kingman Reef. There are no permanent inhabitants, but there are facilities and a research station for temporary residents such as scientists and scholars. The atoll is a National Wildlife Refuge. Wake Island as seen from an airplane. Public domain photo by Tech. Sgt. Shane A. Cuomo of the U.S. Air Force. Click to enlarge. FAQ: U.S. Extended Continental Shelf: U.S. Department of State website, last accessed October 2018. Oceans & Law of the Sea: United Nations Division for Ocean Affairs and The Law of the Sea, last accessed October 2018. Bajo Nuevo Bank, also known as the Petrel Islands: Two coral reefs in the Caribbean Sea, located about 150 miles southwest of Jamaica. Administered by Colombia but claimed by the United States and Jamaica. Navassa Island: A small island about 35 miles west of the southwest peninsula of Haiti. Claimed by Haiti and the United States. Serranilla Bank: A former atoll, now mostly submerged, located in the Caribbean Sea about 200 miles southwest of Jamaica. Administered by Colombia but claimed by the United States and Honduras. Colombia maintains naval facilities on the islet of Beacon Cay. Wake Island: A remote coral atoll in the Pacific Ocean, about 2,000 miles southeast of Tokyo, Japan. The main island has an airfield, a missile launch center, and facilities that house U.S. military personnel. Wake Island is administered by the United States but claimed by the Marshall Islands. Copyright information: The map at the top of this page was composed by Angela King of Geology.com. If you want to share this map with others, please link to this page. The map is property of Geology.com and may not be used beyond our websites. It was created using data licensed from and copyright by Map Resources.